In 1854 German brothers Löb and Moses Simson bought one third of a steelhammer works in Suhl, founding Simson and Co. two years later to focus on production of carbon steel. Over the next decade the factory gained a reputation for their guns and gun barrels; in 1871 they installed their first steam engine and by 1896 they had begun expanding their operations into the production of bicycles. In 1907 Simson Co. began automobile production with the “Simson A”, but the war intervened in the automotive business and the company quickly reverted to their more lucrative contracts in arms manufacture, turning out Mauser Gewehr 98 rifles for the German Army. 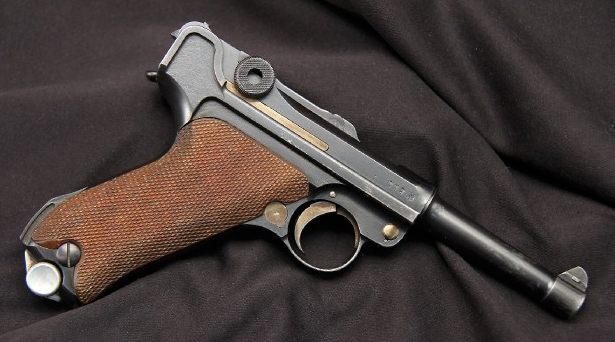 After the Treaty of Versailles the reorganized Reichswehr was restricted to buying handguns from a single company in order to limit the recovery of the arms industry; larger manufacturers such as DWM were passed over in favor of Simson precisely because of its lower production capacity, and as such Simson was the sole producer of military-contract Luger pistols from 1925 to 1934. Along with their Luger model Simson also was responsible for repairing and refurbishing the Reichswehr’s existing Gewehr 98 and Karabiner 98b rifles, MG08 machine guns and MP18 submachine guns. Beginning in the 1920s Simson also produced the .25 ACP Westentaschenpistolen (“vest pocket pistols”) their only venture into commercial handgun production until 1989. These pistols were available in two almost identical models, the first known as Model 1 in German and Model 1922 in the United States, and the second as Model 2 in Germany and Model 1927 in the US. From 1914 to 1915 Simson restarted limited automotive production with a four-cylinder 1.5 liter, 22hp. model A and a 2.6 litre, 28hp model C. Production was placed on hold again until 1919, when the company finally resumed their model line with a new 1.6 liter 22hp model Bo, the 1.6 liter 40hp model Co and a 3.5 liter, 45hp model D. Top speeds were 80 km/h (50 mph) for the Co and 90 km/h (56 mph) for the D. In 1923 Simson replaced the D with the 3.6 litre, 65 bhp model F, their first 100 km/h (62 mph) production model. 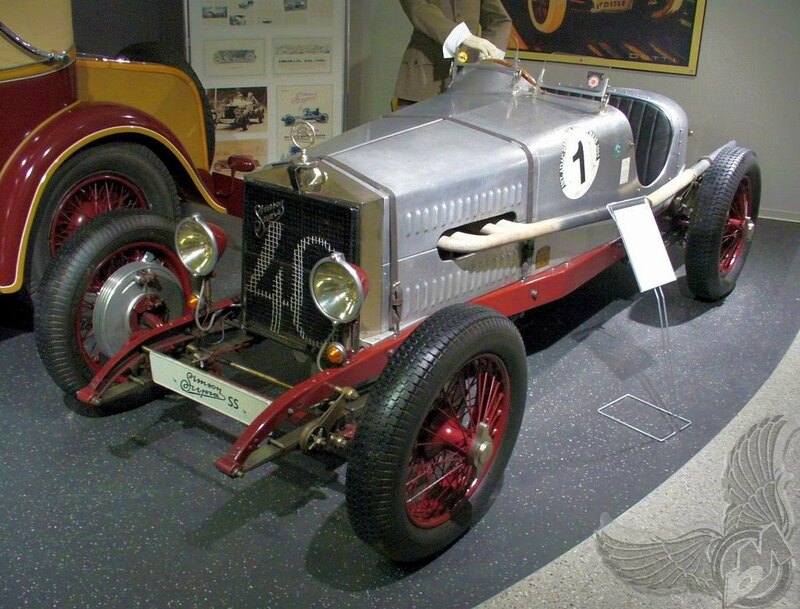 In 1924 the range of cars was completely revised and redesigned by Paul Henze and given the Simson-Supra name. The first Supra models were the S and the S Sport, with a four-cylinder, two liter long-stroke DOHC engine. The S produced 50hp and had a 120 km/h (75 mph) top speed; Sport had 60–80hp and a top speed over 140 km/h (87 mph). In 1925 a SOHC So version was introduced. 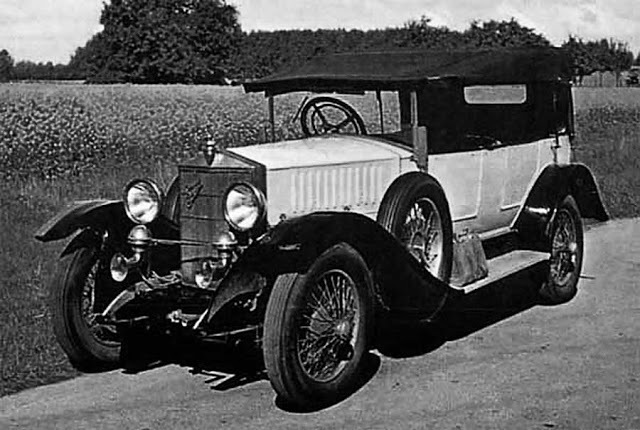 The S and S Sport were discontinued in 1926 while the So continued until 1929. In 1925 Simson introduced the model J, its first six-cylinder car; it was succeeded in 1926 by the model R, with an OHV pushrod engine. In 1931 the model RJ was introduced with 3.3 litres displacement and 70hp; that same year Simson introduced the first and only eight-cylinder Supra, the Supra model A. Its engine shared the RJ’s long-stroke dimensions of 79.5 x 115 mm, giving it 4.7 litres displacement. This produced 90 bhp and gave a 120 km/h (75 mph) top speed. The Simson family was Jewish, and with the rise of Hitler’s Nazi party in in 1936 they were forced to flee Germany. Under the laws dispossessing Jewish industrialists a trustee took control of the firm, and it was merged with other factories to form the Berlin Suhler Waffen- und Fahrzeugwerke (BSW). 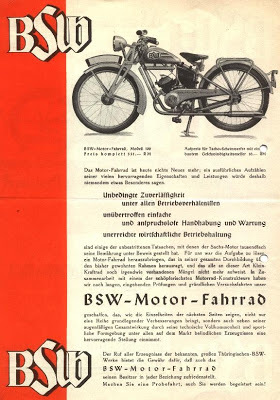 That same year the factory produced its first motorcycle, the BSW 98, which had a 98 cc engine and two-speed transmission. Critics of the Nazi government suggested a different meaning for the BSW initials: Bis Simson Wiederkommt (“until Simson returns”). 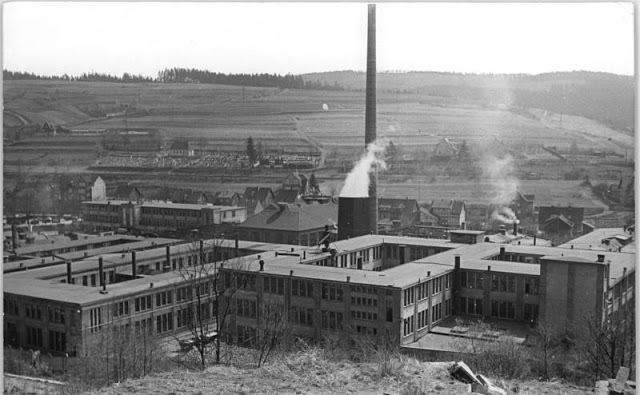 During the war the factory increased weapons production under the title Gustloff-Werke – Waffenwerk Suhl, named after assassinated Swiss Nazi Wilhelm Gustloff. 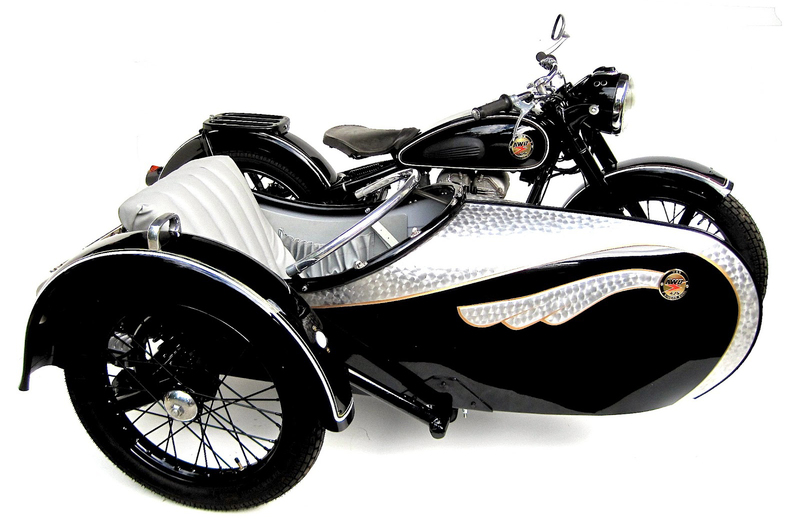 Sachs-engined motorcycles from 47 cc to 123 cc were made within the Gustloff group from about 1934 until about 1940 and continued to build bicycles, weapons and cars until 1945. In 1946, by order of the Soviet Military Administration in Germany the manufacturing plant was partially dismantled and transported to the Soviet Union (USSR) as part of the Soviet reparations program. In 1947 the factory was integrated into the Soviet Sowjetische Aktiensgesellschaft Awtowelo (SAG Awtowelo or “Soviet Avtovelo Company Limited”). 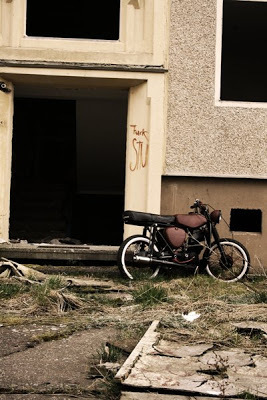 Initially all production was for export to the USSR, however the Soviets later handed control of the factory to the German Democratic Republic (DDR) and in 1952 it was renamed Volkseigener Betrieb Fahrzeug- und Gerätewerk Simson Suhl. Production of sporting guns, prams and bicycles slowly resumed, but the main focus was now on making motorcycles. 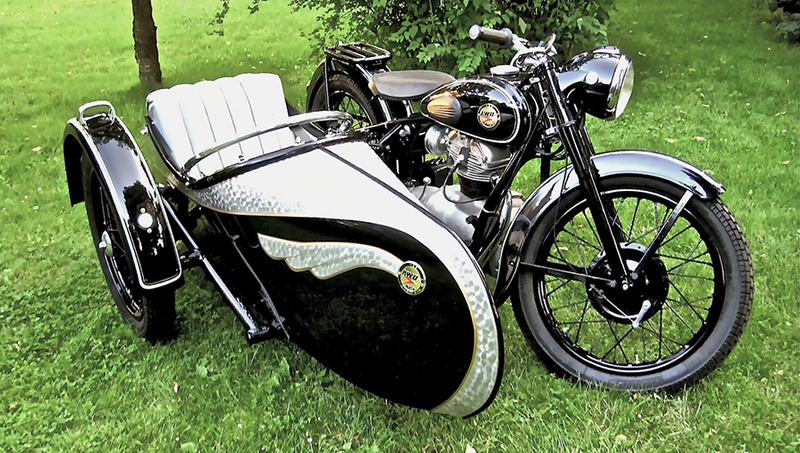 AWO 425 with Stoye sidecar, arguably one of the most beautiful motorcycle combos ever made. 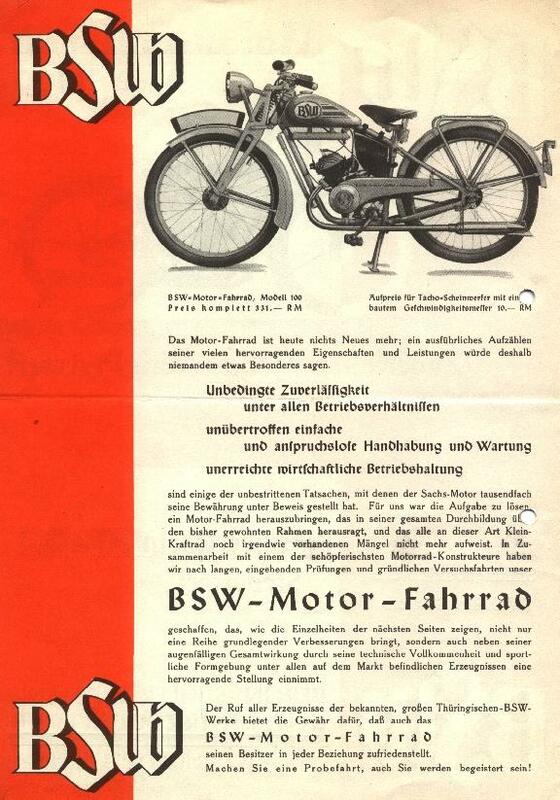 Between 1949 and 1962 the Suhl factory produced more than 209,000 four-stroke motorcycles designated 425 (four-stroke engine with 250 cc displacement). 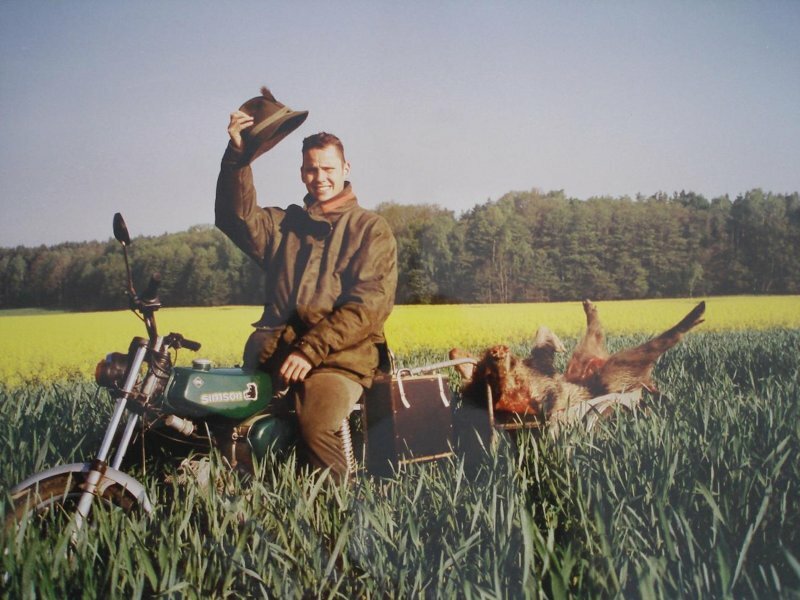 The motorcycle featured overhead valves in a V-formation, four-speed transmission, shaft final drive and a duplex cradle frame: the 12hp engine produced a top speed of 100 km/h (62 mph). Branded the AWO (an abbreviation of Awtowelo) it earned a high reputation in the Eastern Bloc countries from 1949 until 1955, when the Simson name was finally revived. Some had Stoye sidecars fitted, and a Stoye Campi luggage trailer could also be fitted. The first 1,000 machines built from July 1949 until December 1950 were exported to the USSR, then released to the DDR domestic market in 1951. 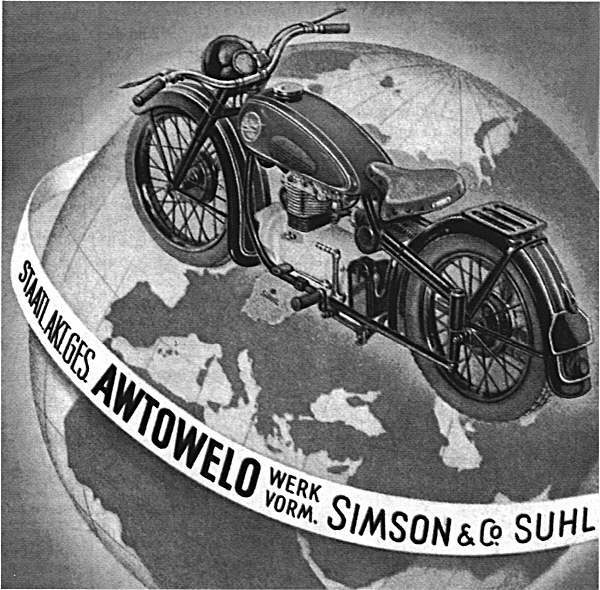 In 1955 Simson introduced the 425 S (Sport) model with twin-shock swing arm rear suspension and a top speed of 110 km/h (68 mph). Initially the 425 S had 7.2:1 compression and produced 14 bhp; in 1961 this was increased to 8.3:1 which increased power output to 15.5 bhp. The 425 S ran from 1955 until 1962, with a total of 85,000 built. In 1953, 15 AWO 425 R. racing machines were built. A version with chain-driven double overhead camshafts appeared in 1955 and produced about 28hp. But by 1958 Simson’s racing team found it necessary to switch from shaft drive to chain drive, which meant that it had to develop a new engine as well. Alongside their proven single cylinder engine, Simson also developed a 250 cc parallel twin that produced more than 30 bhp at 10,000 rpm. Like the single, the twin’s valves were in a V-formation and it had a six-speed transmission and chain final drive. The twin was introduced with chain driven double overhead camshafts, but for the following season the engine was revised with shaft-driven overhead cams. Simson also developed a new motorcycle frame for racing, with a leading link front suspension and long swingarm rear suspension. The Simson twin proved fast but the bike was plagued with teething troubles; MZ won numerous international victories in the 1950s, but Simson’s wins were confined to domestic competition. Simson won the DDR-Meisterschaft (“GDR Championship”) in 1953, 1954 and 1955, but in 1958 the Allgemeiner Deutscher Motorsport Verband (ADMV, “General German Motorsport Federation”) decided that in the 1959 season works riders would not be allowed to compete in the national championship. A Geländesport (“Enduro”) version of the swinging-arm framed S model (425 GS) was introduced in 1957 and about 80 examples were built until 1959. Simson then developed a version of its single-cylinder engine enlarged to 350cc for Enduro and Motocross competition: the enlarged GS engine provided such good performance that Simson expanded production for competition machines. 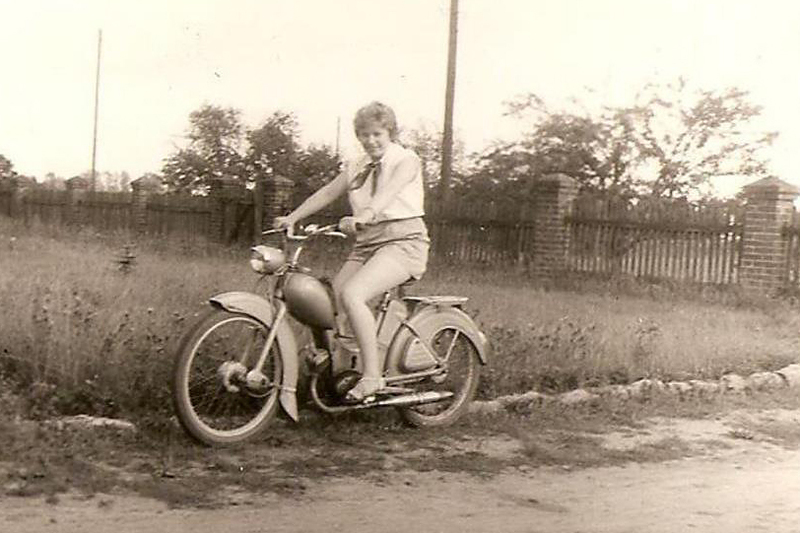 In its first years of competition the GS suffered numerous competition defeats, but Simson systematically improved its reliability. By the time four-stroke production was ended at the end of 1961 the Simson works team had won competitions both in the DDR and abroad, and because of its competitiveness and reliability the GS model was used to equip the DDR’s national Six Days Trial team. 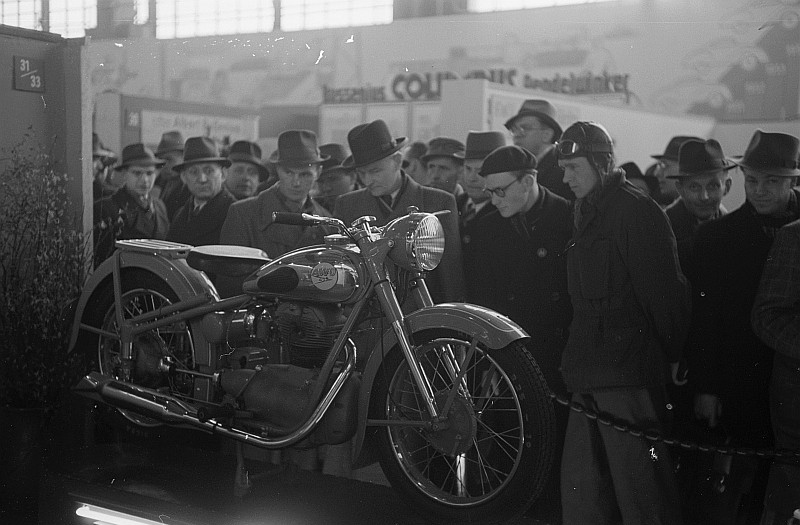 In the early 1960s the DDR introduced a policy of Kapazitätsbündelung (“capacity concentration”), under which the production of larger motorcycles would be concentrated at the MZ works at Zschopau. 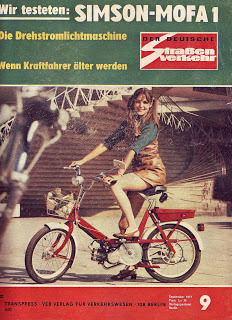 The DDR’s Volkswirtschaftrat (“People’s Economic Council”) terminated Simson four-stroke manufacture in December 1961 and from January 1962 all new private cars and motorcycles had to be two-stroke. 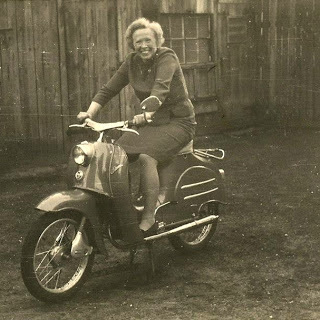 But Simson had already been producing two-stroke mopeds since 1955; their first model was the SR 1, a 48cc machine producing 1.5 hp. 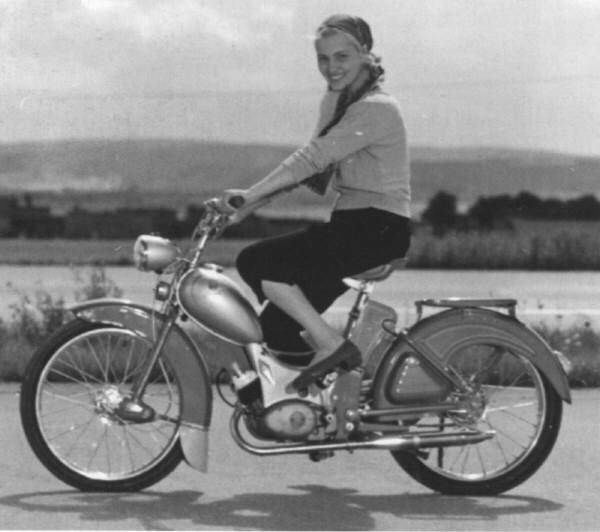 In 1958 Simson launched the KR 50, with integral leg shields and a rear wheel enclosure like a motor scooter, but 16-inch (410 mm) wheels like a small motorcycle. The KR 50 had a 48cc motor like the SR-series, but with a higher compression ratio that increased power output to 2.1hp. When four-stroke motorcycle production was terminated, the Simson factory increased the KR 50’s power to 2.3hp. In 1964 this model was succeeded by the KR 51 Schwalbe (“swallow”), increasing power by almost 50% to 3.4hp. Moped production grew steadily in Suhl; up to 200,000 mopeds were built per year and in 1965 the Simson factory employed 4,000 workers. In 1968 Simson was merged with VEB Ernst-Thälmann-Werk Suhl to form the VEB Fahrzeug- und Jagdwaffenwerk Ernst Thälmann Suhl. The Schwalbe helped the company to worldwide fame, and in the DDR the scooter stood for the success of East German two-wheeler motor manufacturing. That same year the KR 51/1 series was introduced with power increased to 3.6hp, followed in 1979 by the KR 51/2 series with 3.7hp. 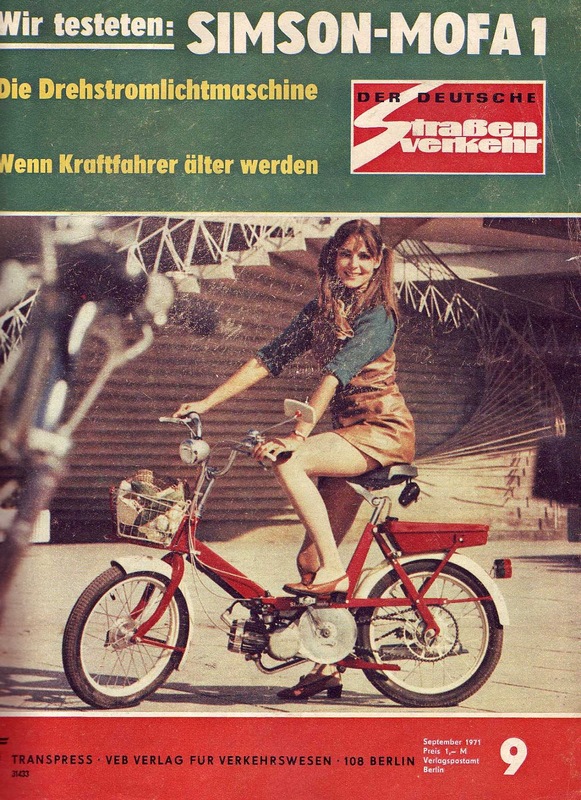 Schwalbe production was ended in 1986 in favour of more modern 50cc moped models. 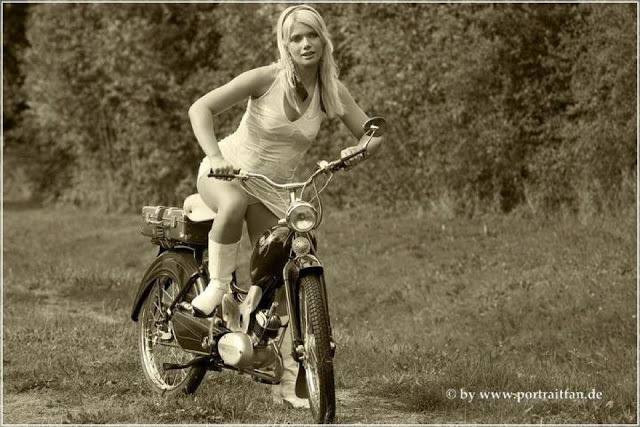 In 1970 Simson introduced a bicycle-style, pedal-start moped, the 50cc, 1.6 bhp SL 1 Mofa. In 1975 Simson revised its image with a new model, the S 50 which was produced in various versions until 1980. Its successor was the S 51, in which Simson revised the styling again and returned to a long-stroke engine, this time with 38 x 44 mm dimensions and a 3.7 bhp output. The S 51 was built in various forms until production was ended in 1990. 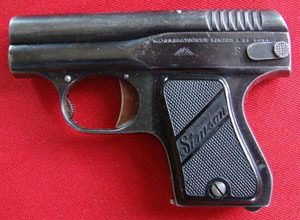 After East Germany’s Peaceful Revolution in 1989 and German reunification in 1990, a number of attempts to modernize the assembly lines were made, including commercial production of Makarov PM pistols but fewer than 1,000 commercial Makarovs were made under the Simson name before production was discontinued. In 1990 the S 51 and S 70 models were revised as the 50cc S 53 and 70cc S 83, but total production from 1990 until 1994 was only about 10,500 machines. In 1992 Simson resumed tricycle production with a 50cc, 3.3hp SD 50 LT, based on the SR 50 scooter but with a single seat and 360-liter cargo space behind it. The model was named the Albatross, and production continued until 2002. In 1993 the Suhl factory began making the Hotzenblitz electric car under contract for Hotzenblitz Mobile GmbH and Co. KG of Ibach in Baden-Württemberg. The car had two seats and weighed 780 kg (1,700 lbs. ), producing only 16 bhp with a range of only 100 km. The car had little success and only 140 were built until production ended in 1996. The SR 50 and SR 80 scooters were revived that same year. In 1996 Simson revived the Star name for a new 50 cc scooter with more curvaceous, fully enclosed bodywork. 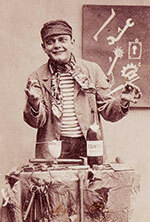 The company also introduced a 5.1hp version of the 50cc machine, renamed the Sperber. In 1999 the Sperber Sport with a full sports fairing was released, along with a new model Spatz with a space frame. In 1998 Simson introduced a 125cc model, the Shikra, powered by a Honda four-stroke 15 bhp engine built under licence in Taiwan. In 2000 the Shikra name was discontinued, power output was reduced to 13.6 bhp and the model became simply the Simson 125. Although several investors tried to keep production going and to bring new developments on market, but after the political changes in East Germany in 1989 numerous attempts to modernize the assembly lines failed. 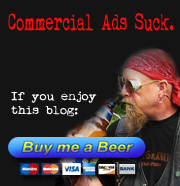 but production finally ceased in autumn 2002. On February 1, 2003 bankruptcy proceedings were held, in the wake of which the remaining 90 employees were made redundant without any compensation. The Schwalbe has since gained cult status in western Germany and the AWO models are increasingly popular throughout Europe.